As transport operators serving the Middle East Gulf region scramble to adjust to its rapidly changing political dynamics, German shipping line Hapag-Lloyd may inadvertently have found itself at the centre of the escalating diplomatic dispute. On Monday, Saudi Arabia, the UAE, Bahrain, Egypt and Yemen, as well as Libya, Mauritius and the Maldives, severed diplomatic relations with Qatar and blocked flights and ocean voyages to the country from its airports and seaports. However, the recently completed merger between Hapag-Lloyd and Gulf-based United Arab Shipping Company (UASC) meant UASC’s two shareholders – Qatar Holding and Saudi’s Public Investment Fund (PIF) – took 14.4% and 10.1% stakes in the combined company. Bringing the two Gulf firms into Hapag-Lloyd’s shareholding structure was central to the German line’s plans to reduce its debt burden, as liner shipping analyst Alphaliner explained today. “Qatar Holding and PIF agreed to backstop 50% of the planned $400m cash capital increase through a rights issue in Hapag-Lloyd that was supposed to take place within six months of the closing of the merger. The remaining 50% of the capital increase was to be funded by CSAV and Kühne Maritime. Meanwhile, other shipping lines have begun to notify Qatari shippers and forwarders doing business with the country of changes to services. Yesterday, Dubai operator DP World and Abu Dhabi Ports Company (ADPC) announced a ban on all Qatar-flagged vessels; all those departing to and arriving from Qatar, regardless of flag; and all vessels loaded with freight destined for or leaving Qatar, including transiting cargo. Saudi Arabia and Bahrain have similar bans in place. Most immediately affected is Qatari carrier Milaha Maritime & Logistics, which runs four regional services connecting Qatar with ports throughout the Gulf, deploying 11 vessels of 500-2,800 teu. But it is not altogether cut off, Alphaliner suggested. “Ports in Oman, Iran and Kuwait are expected to remain open to Qatari ships, and some of Milaha’s ships could be diverted to ports in these countries in order to retain connections by sea with the rest of the world,” it said. The status of foreign-flagged shipping lines is lightly harder to gauge, given that Qatar’s small population has meant its main port of Doha is generally served via feeder links from the region’s main transhipment hubs – principally Dubai. However, according to Alphaliner, Doha is on two deepsea services – the Ocean Alliance’s MEA2 and MSC’s Falcon – and both also call at Dubai and the Saudi port of Dammam. Cosco yesterday released a customer advisory to European shippers and forwarders that it had stopped taking goods to Doha, and Maersk Line said it was looking for alternative routes into Qatar. With the UAE’s other main transhipment port of Khor Fakkan also out of bounds to Qatari cargo, carriers may opt to utilise the deepsea ports of Sohar and Salalah, in Oman, not party to what effectively amounts to a trade blockade – and Maersk remains a shareholder in Salalah. 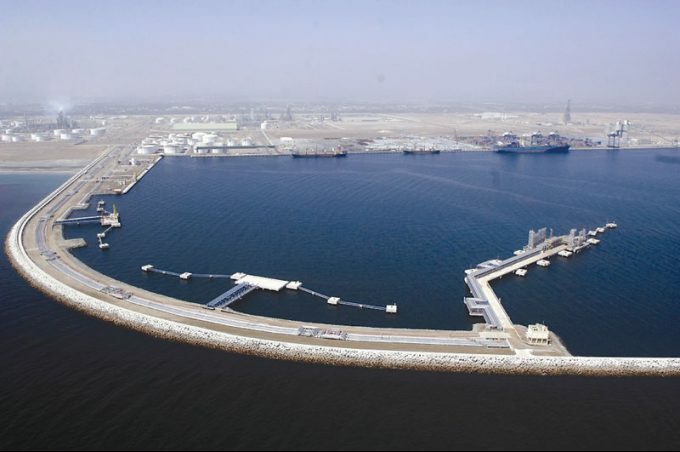 “The port of Sohar in Oman could replace Jebel Ali as the main relay hub for container cargo to reach Qatar in the near term while the diplomatic tension remains to be resolved,” it said.